When I typed up my last post, I had been at site for about a full day and I hadn't cried yet, so obviously something had to change. It kind of felt like it did when we first got to Moldova and I thought, I'm in over my head, I don't understand anything anyone's saying, I can't do this.. Only I thought I was over that, kind of..? But it turns out I wasn't. My partner gave me a tour during lunch hour (lunch 2 hours? Not sure about that) and it lasted all of five minutes because everything is apparently in the center of the village and the village is tiny. Everything is under repair or needs repairs or is just sad, so the tour was kind of depressing. There is no water in the mayor's office so we went to a communal outhouse building to go, so THAT was fun. When we toured, we stopped in every little tiny shop (all seem the same, so why there are like 4 of them, I have no clue) and she bought random food items - sausage, bread, a huge bag of tomatoes I wasn't going to eat.. And then we went back to the office and had lunch. She said everyone goes home for lunch but she hates the heat so she doesn't want to walk the 10 minutes back to her house for that and that I probably wouldn't either. But I will say that if it means I have running water to at least wash the fruit with, I will absolutely walk the 15-20 minutes back. We had tea and then later I found out that when she "washes" the tea cups she rinses them (soap? what's that? never heard of it!) in disgusting yellow well water, so I will be bringing my own cup for tea from now on because I'm not planning to get sick and/or die. I also didn't understand anything all day, except for when we had tea and she talked slowly and at a normal volume. After lunch I didn't even do anything except sit there and read my Kindle, so I could have been that useless anywhere. So with a sad tour and a full day of not understanding anything/doing anything, I was over it and I wanted to go home. Instead I went to the host house in the village and after eating, there was nothing to do there either so I went to "rest" and just read on my bed-couch until 7:30ish which I thought could be a bedtime, kind of. I missed Ionela coming into my room and messing with my stuff, even. Then at like 10:30-11, host mother came in and started talking to me, which was confusing A. Because I had just been asleep and B. Because it was in Romanian and I DON'T SPEAK THAT, but I finally figured out that she wanted me to talk to her son on Skype, which I had to do then. He was very nice and spoke great English (I think he's been living in Texas for 6 years now?) and it was probably worth it to get up to talk to him because of what happened the next morning. The mayor was picking me up at 7. About 6:48 (just guessing here, but imagine it's close to 7) she says she made coffee so I go have some, and she wants me to eat some breakfast cookie thing that I don't want so I say no. She asks, don't you like it? I say, I like it, but I don't want. She wants to know why and I get upset and leave so I can cry because I can't explain anything to this woman, so naturally she follows me and gets very upset and starts to cry herself, which makes me feel awful, because I literally have no words to tell her anything like, it's not your fault, I just cry a lot, etc. So she assumes I hate it here and I won't come back because of something she did (just assuming this myself, but that's what it seems like) and she runs to her room and gets out this notebook and her cell phone and calls her son. It's way closer to 7 so I'm thinking the mayor will be here any second and we're both crying and she can't get the phone to work.. I ask for her son's email so I can write to him later and ask him to explain to his mother what's going on..
She insists on Skyping him (and I'm confused by this since I have no idea what time it is in Texas, but apparently it was a reasonable time as he had just gotten off work), so I'm crying on the webcam to this stranger (well, everyone's a stranger, really) and he's just so kind about it. He says he knows exactly how I feel because he didn't speak any English when he came to America. He tells me it will get better and I will make friends, and until then I will go to Chisinau or the raion center and meet my friends there ("You're young, you'll go dancing" - thanks, you're maybe 3 years older than I am). He said, "It's easy to go from something bad to something good, but it's hard to go from good to bad." He thanked me for coming to his village and for the work I would do there, and thanked me for staying with his mom, and told me to smile because I have a beautiful smile, and that if I ever need anything at the house or I don't like something, just tell him or his mom and they will fix it (they talk every single day). He said they'd get Internet for my room so I could talk to my family (I think she argued about this with him but eventually I will find a way to get Internet in this village) and was basically just a great human being and the start to the day improving. The mayor arrived (and I'm pretty sure host mom was still crying and she told him about how I was crying) and we left. He told me (I think) that his daughter cries too and someone translated for me later that she is in another country also and cried a lot at first but now she doesn't even miss Moldova. We stopped a bunch before fully leaving the village: first to go to his office and sign something or other, then to talk to some men on the road.. When he reentered the car after this, he was giggling and gave me a handful of plums, which I set on my lap. A kilometer or 2 later, we saw a van and a car on the side of the road and stopped again. 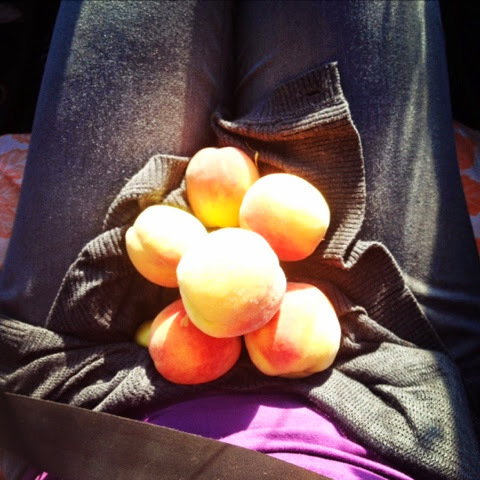 Men were loading boxes from one vehicle to the other, and I thought he was stopping to help or something, but he came back with an armful of peaches to set on my lap, giggling again! I only understand him about 20% of the time (that might be generous, I don't know) but he is so hilarious! He jokes about everything and is just the most adorable man. We picked up my friend and her partner on the way and eventually got to Chisinau for our partner conference. During the first session, he was like, so I have to leave. Is that cool, Katya? UMMM NO IT'S NOT, but whatever! He said he'd definitely be back for the important part tomorrow, so we introduced ourselves and he jetted off with some document. But after everyone introduced themselves (a lot of translating had to happen so it took awhile) and we had a coffee break, he was back! We got to do partner activities together (my partner couldn't come, so he did, which was apparently a big deal because if a MAYOR shows up that means he's really motivated about working with a PCV and getting stuff done) and with the help of translators, may have even communicated a little! Occasionally they would ask partners to share stuff, so whenever he raised his hand I was like, oh no, what's he going to say now.. He started talking and half the room burst into laughter - then I found out he was saying that they wouldn't let me eat or sleep until I learned Romanian - We will help her! Hilarious. Good one, mayor. So the site visit itself was not the greatest, but I am thinking that it won't be as terrible as I was thinking 24 hours ago, because the mayor is awesome and he has a lot of things he wants to do that hopefully I can help with.. The site team conference continues tomorrow so he'll probably get to amuse everyone some more, and that will be great. PLUS he said I can ride a horse cart, so that's going to be fantastic. Can't quit until I do that, so I guess I'll have to stick it out a little bit longer.